I’d just like to say, HOW AMAZING MY BOX IS THIS MONTH! 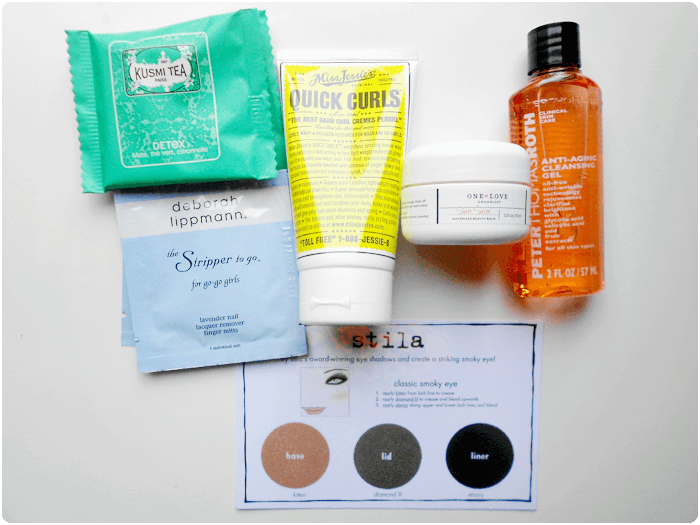 My faith in Birchbox has been renewed! As you can see, with the exception of the Stila eyeshadow palette, EVERYTHING else is a deluxe sample, heck, better than deluxe really considering the size of them! Peter Thomas Roth? UM YES PLEASE! I love his products and use them daily and Deborah Lippmann? Well, you’ve all seen my nail polish obsession! I’m really excited to try the curl cream because I do have curly hair and yay for green tea (I only like green or white tea)! I’m curious about the waterless beauty balm, it’s nice to have something I can toss in my purse for those occasions where I need to quickly remove jacked up makeup or dirt. Overall, I am super pleased with each and every single product I got in my box this month and hope the trend continues! I opted for the Teen Vogue box and was really pleased with what I received! A full size Essie nail polish (A Cut Above), full size Tarte LipSurgance, Annick Goutal Petite Cherie sample, Shiseido blotting papers, and a Twistband hair tie (which I’ve received in the past). I’ve actually received the Lippmann polish remover pads in a previous box and really loved them! Wow! I am going to have to check that out!